Although 1st of September marks the start of spring (in Australia), this date is a simplification as true spring starts with the arrival of the spring equinox on the 23rd of September. This is when the plane of the Earth’s poles are the same distance from the Sun. The amount of daylight is roughly equal to its absence, heralding the true exit of winter as the daylight hours increase from there on. In the cool climate of the Macedon Ranges, classically budburst begins occurs from anywhere from late September to early-mid October, roughly following the spring equinox. 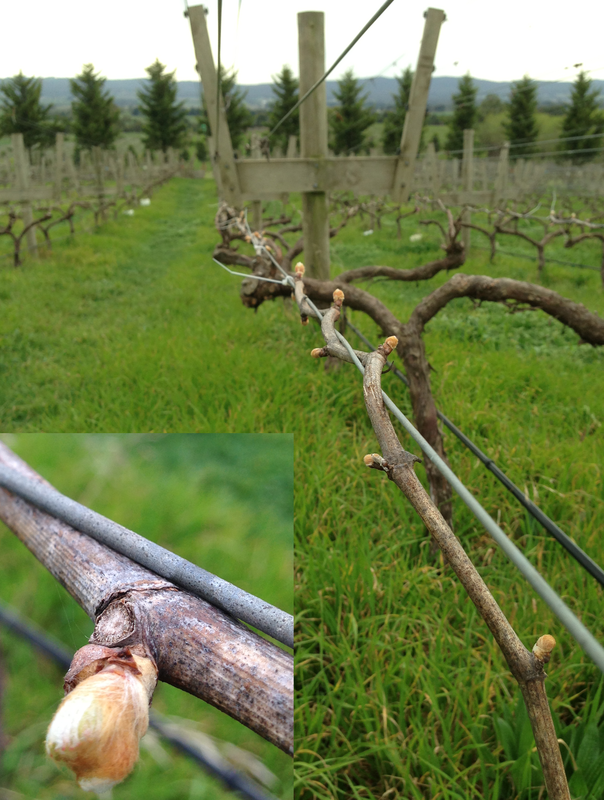 But this year budburst has followed the calendar with almost bullet precision, occurring on the 3rd of September. It is worth noting that an early budburst doesn’t necessarily mean it will be an early vintage, far from it. Our warmest winter was in 2001 (average of 10°C) but it led to our coldest growing season which culminated with the 2002 vintage. The next warmest winter was that of 2005 (average of 9.9°C) which did lead to warm growing conditions, and the resulting 2006 vintage is one of our most celebrated. This winter was the third warmest for us (average of 9.8°C) and with the above in mind, the passage of weather can be cold, hot and everything in between, all of which effects the ultimate harvest date. The best indicator of harvest date though is flowering & fruit set. If that is early, then harvest will most probably be early too and vice versa if it is late. We’ll keep you posted on that. From there the longer term forecast (from the BOM) is for moderate to above average warmth and above average rainfall. With the weather still not committing to being in a La Nina/El Nino pattern, but rather remaining in a neutral state, this can lead to wetter than ‘normal’ conditions, but not as prolific as it would be if it were in La Nina pattern. So as always we wait and see what the year delivers and of course we look forward to hopefully putting it into bottle.